THERE was a very beautiful girl in Jepara Central Java. She was very famous for her beauty. People loved her very much. She was kind and polite. Many young men fell in love with her. They had met and proposed her. However, the proposal was always rejected. It was because they could not fulfill her request. She would marry any man who could give her an elephant. Elephants were wild animals. No one kept elephants as their pets. However, the girl loved elephants very mu ch. She had been dreaming to have an elephant. There was a great man lived in Kudus. His name was Ki Ageng Kedungsari. He had heard about the beautiful girl. He also knew that the girl asked an elephant from a man who wanted to marry her. Ki Ageng Kedungsari had great supernatural power. He used his power to catch and tame an elephant. After the elephant was tamed, he wanted to bring it to Jepara. He would propose her. In the meantime, people were talking about Ki Ageng Kedungsari. They were amazed with his power to tame an elephant. They all thought that elephants were too difficult to handle. One of the people who heard about Ki Ageng Kedungsari's elephant was Ki Ageng Menawan. He had been in love with her for a long time. Unfortunately he did not have the power to catch an elephant. So, when he heard that Ki Ageng Kedungsari was able to catch an elephant, he was very jealous! 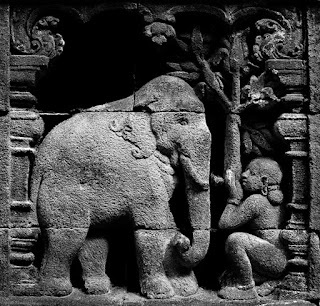 Ki Ageng Menawan planned to steal the elephant. However, he knew he could not beat Ki Ageng Kedungsari alone. He had to ask someone to help him fight Ki Ageng Kedungsari. He had someone in his mind to help him. It was Ki Watu Gede. Ki Ageng Menawan and Ki Watu Gede were hiding behind a big tree. They were waiting for Ki Ageng Kedungsari. After a while, finally they saw him walking toward them. Ki Ageng Kedungsari was walking gently. Next to him was his elephant. The elephant was big. It had big ivories. It looked so wild. However, the elephant was very tamed under Ki Ageng Kedungsari's control. While he was walking suddenly two men were standing in front of him. They were Ki Ageng Menawan and Ki Watu Gede. "Stop! Give us your elephant!" said King Menawan. "Ha ha ha. I don't know who you are and I don't see any reason why I should give you my elephant" said Ki Ageng Kedungsari. "Well.... The reason is because I will give the elephant as my wedding proposal. Now! Give me your elephant!" ordered Ki Ageng Menawan. "No way!" said Ki Ageng Kedungsari. The fight could not be avoided any more. Ki Ageng Menawan and Ki Watu Gede helped each other. They were fighting side by side to beat Ki Ageng Kedungsari. Although it was one against two, Ki Ageng Kedungsari was able to balance the fight. The three of them were very powerful. They were fighting for days and there was no any sign that someone would give up. Finally, the three of them were trying to grab the elephant. Ki Ageng Menawan was holding the head and the front part. Ki Ageng Kedungsari was holding the body and Ki Watu Gede was holding the back part of the elephant. They were holding so tightly that the elephant was broken into three big pieces: the front part, the body, and the back part. They all brought their parts to their hometown.